The National Weather Service has issued a winter weather advisory for our area from 7:00 pm Saturday through 1:00 am Monday. 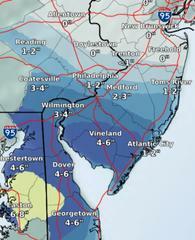 Expected snowfall totals have increased to 3-5 inches for our area. A Winter Weather Advisory for snow means periods of snow will cause poor travel conditions. Expect snow covered roads and limited visibility. Please use caution while driving and allow yourself extra time for your commute.